You will like the fact that Cabin 112 is located on the Flying Arrow Resort property riverside grounds with it's great access to the river and lawns. On the other side of the cabin is a covered deck with a charcoal BBQ where you can enjoy the sights and sounds of the river while having dinner. The bathroom has both a shower and a tub. From the deck you can see and hear the Wallowa River. This cabin also includes a television, DVD player, gas fireplace, and well-appointed kitchen for your enjoyment. This cabin is close to cabins 101-111, Minnow, and Fawn, so multiple families could reside in the same area! It is also close to lots of activities including hiking trails, restaurants, horseback riding, and more! 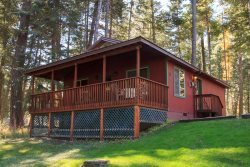 Come to this cabin with your family and enjoy the beauty of Wallowa County!